Objective: Objectives- 1. 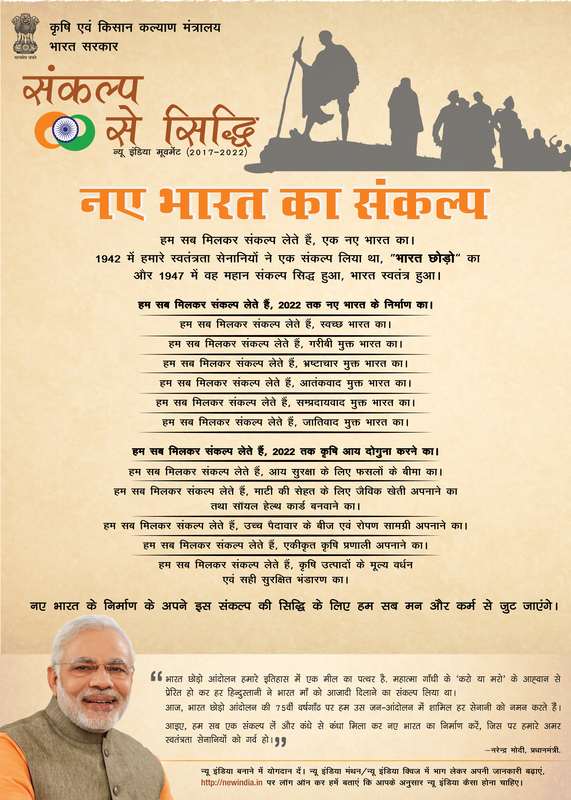 To build a New India by 2022. 2. To make a Clean India. 3. To make a Poverty free India. 4. To make a Corruption free India. 5. To make a Terrorism free India. 6. To make a Communalism free India. "New India Manthan- Sankalp Se Siddhi" programme was organised at Baska Jr. & Degree College, Baganpara on 27.8.2017. The Chief Guest were Shri Biswajit Daimary, Hon’ble MP (Rajya Sabha)Shri Naba Kumar Sarania, Hon’ble MP (Lok Sabha), Kokrajhar. The meeting was chaired by Mr. A. K. Boro, Executive Member (Agri). The other dignitaries present in the programme were- Mr. T. Basumatary, MLA(Sapaguri) , Mr. M. Brahma, MLA(Barama), Mr. P. Basumatary, MCLA, Dr. H. C. Bhattacharya, Director of Extension Education, AAU, Dr. B. C. Deka ,Director, ATARI, Zone III, Mr. M. Choudhury, ADC,Baksa and Heads of line Dept.s of Baksa District. No of Farmers attended the programme was 530. Chief Guest's Remarks:1. Shri Biswajit Daimary, Hon’ble MP (Rajya Sabha), commented that KVK, Baksa performed really a good job by organizing this auspicious occasion “ Sankalp Se Siddhi”. He urged each and every farmer of the district to cooperate with KVK, Baksa and all line Dept. Related to Agriculture for their upliftment of Agricultural production which must lead to doubling the farmer’s income by 2022. Simultaneously, he also suggested all the line Dept. of Agriculture to work hard to fulfil the dream of our Hon’ble Prime Minister. 2. Shri Naba Kumar Sarania, Hon’ble MP (Lok Sabha), Kokrajhar, appreciated KVK, Baksa for organizing this auspicious occasion “Sankalp Se Siddhi”. He urged all the Scientists of KVK, Baksa and Officers of line Dept. related to Agriculture to work with the farmers located each and every corner of the district. He suggested to create awareness among the farmers on modern agricultural practices to doubling farmer’s income by 2022. Post Event Details:The “ New India Manthan-Sankalp Se Siddhi” programme was organised at Baska Jr. & Degree College, Baganpara on 27.8.2017. The Chief Guest were Shri Biswajit Daimary, Hon’ble MP (Rajya Sabha)Shri Naba Kumar Sarania, Hon’ble MP (Lok Sabha), Kokrajhar. The meeting was chaired by Mr. A. K. Boro, Executive Member (Agri). The other dignitaries present in the programme were- Mr. T. Basumatary, MLA(Sapaguri) ; Mr. M. Brahma, MLA(Barama); Mr. P. Basumatary, MCLA; Dr. H. C. Bhattacharya, Director of Extension Education, AAU; Dr. B. C. Deka ,Director, ATARI, Zone III; Mr. M. Choudhury, ADC,Baksa and Heads of line Dept.s of Baksa District. 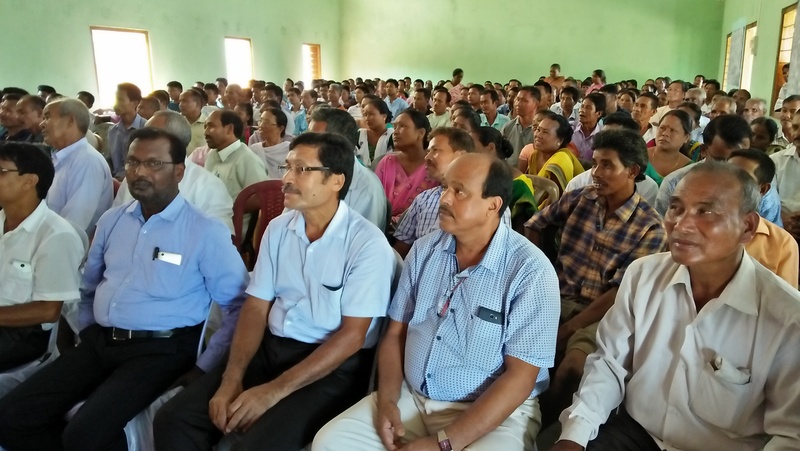 No of Farmers attended the programme was 530. Video :Chief Guest Mr. B. daimary, MP, Rajya Sabha delivering speech.